Date closed to passengers: Station still open as a terminus of a branch line from Ambergate. Present state: Only the up platform is in use. The buildings on the down platform have been demolished and the track has been lifted. It is hoped that the Peak Rail service, currently terminating at Matlock Riverside, will be extended in to this platform. the use of other companies railways. On the very day that the MBM&MJR was incorporated the London and Birmingham Railway became part of the London North Western Railway (LNWR). The LNWR had a route to London from Manchester and so it had no interest whatsoever in a line that connected into the Midland Railway network so by 1851 it was obvious that the continuation of the line to Buxton was not likely to occur any time soon. The MBM&MJR found itself in financial difficulty and in July 1852 it leased its line to the MR and LNWR for a period of 19 years. This led to a period of stagnation and Matlock Bridge station remained as a station on a branch line. The station’s main facilities located in handsome single storey stone built buildings located on the east side of the line, on the southbound platform. The main building had a pitched roof which extended out from the building to form a canopy. A second building situated a little further north along the southbound platform had a full canopy to protect passengers from the elements. Waiting facilities were also provided on the northbound platform. the MR a great deal of concern and so they resurrected the original plan of the MBM&MJR to take the line on to Buxton. In 1860 work began and the line opened to Buxton in stages finally reaching that town on the 1st June 1863. With the northern terminus of the line now being at Buxton, Matlock Bridge station became even more important, and it was served by more trains including services that went on towards London St Pancras which had opened in 1868. Matlock Bridge became still more important on 1st February 1867 when the MR completed a line from a point just to the east of Buxton to Chinley. This line now gave connections to Manchester. From this point forward the line became a premier route connecting London to the important industrial provincial city of Manchester. After 1871, when the LNWR and MR lease arrangement had expired, the Ambergate to Rowsley line went into Midland ownership. By 1880 passengers could travel from Matlock Bridge to Manchester Central and to London St Pancras as well as to many local and long distance destinations in between. Matlock Bridge was renamed as Matlock on the 1st July 1905. In 1923 Matlock became part of the London Midland Scottish Railway (LMS) but little changed and the pattern of services remained the same with many express trains still calling. was also considered for electrification. From 1960 until 1966 the new Diesel Midland Pullman, or the ‘Blue Pullman’ as it became known, ran along the line but it was an express service that did not stop at Matlock. Much to the surprise of many, the Beeching Report, published on 27th March 1963, recommended that local passenger services between Derby and Buxton/ Manchester should be withdrawn, and all intermediate stations between Derby and Chinley should be closed with the exception of Matlock and Bakewell. 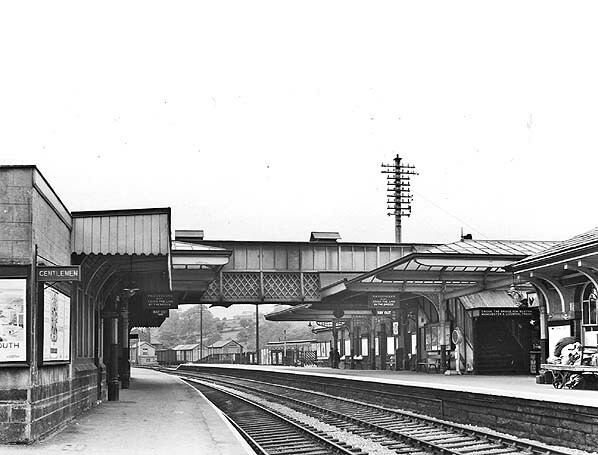 The proposed closure of Bakewell was subsequently added in a legal notice in The Times of 31st October 1963. A BRB meeting on 10th April 1963 gave a mandate for certain studies to be carried out on what were seen as duplicate routes. The findings subsequently appeared in a confidential report, dated March 1964, headed “Examination of Duplicate Routes – Trans Pennine”. This included the Derby to Manchester line, and while it could hardly be described as a Trans-Pennine route, it was part of a duplicate route between Manchester and London. 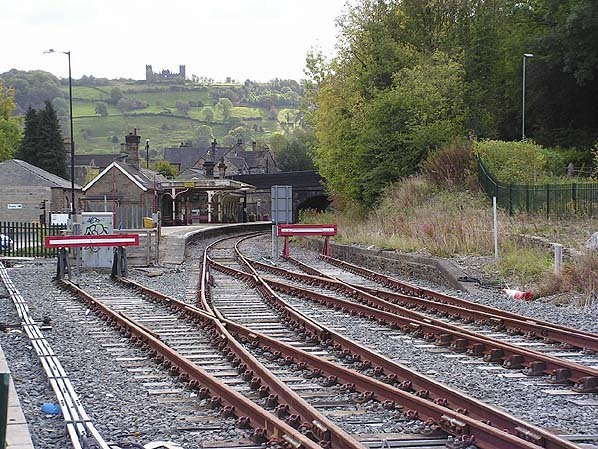 One recommendation proposed the complete closure of the line between Matlock and Peak Forest Junction immediately after completion of the Euston to Manchester Piccadilly electrification, and the simplification of facilities between Ambergate and Matlock, with plans to be put in hand at “an early date”. The net saving was estimated as £142,400. This could not be made public, of course, as the Midland route was the principal one for London to Manchester passenger traffic while the Western Lines electrification was taking place. In March 1964 notices were exhibited for the closure of the local stations, as recommended in the Beeching Report – the scheduled date of closure being Monday15th June. Like many proposed closure dates during that period, 15th June was not practicable and objections to the BRB’s proposals were not heard by the Transport Users Consultative Committee for the East Midlands until the Thursday of the same week. The recommendations from this enquiry then lay with the Minister of Transport for more than two years! New electrified services were introduced between Euston and Manchester Piccadilly on 18th April 1966. At the same time, express services on the Midland lines were remodelled to cater mainly for passengers between Lancashire and the East Midlands rather than London. was now to be closed to passenger traffic. On 14th September 1966 Barbara Castle, the Minister of Transport, finally ruled on the proposal to withdraw local passenger service from the line. Her decision was that the stations north of Matlock should be closed, but those to the south, with the exception of Matlock Bath and Nottingham Road, would remain open but be served by peak hour services only. This meant that Matlock station could not now be closed. The changes to the local services were introduced on 6th March 1967. Now all that remained were eight express passenger trains in each direction that just called at Matlock, and a freight trip service from Derby that served Matlock, Rowsley and Bakewell. In June 1967, the BRB made public its long expected plan to divert the expresses via Chesterfield and the Hope Valley Line. However, Barbara Castle’s ruling on the local passenger services meant that consideration had now to be given to those who used the express services at Matlock. The BRB therefore came up with the ingenious plan of running non-stop services between Matlock and Derby, which would connect into and out of some of the diverted expresses. While the line would be closed to the north, the cost of train operation would certainly increase. It was 11 miles further between Derby and Chinley via the Hope Valley (a further 9 miles was added later when services were diverted in and out of Sheffield), while there were now to be additional trains covering the 17 miles between Matlock and Derby. Although not envisaged at the time, this new service was later to benefit the intermediate stations, which are today served by more trains than at any period in their 160-year existence. South of Matlock, the intermediate stations were destaffed on 1st January 1968, following the installation of electric lighting. 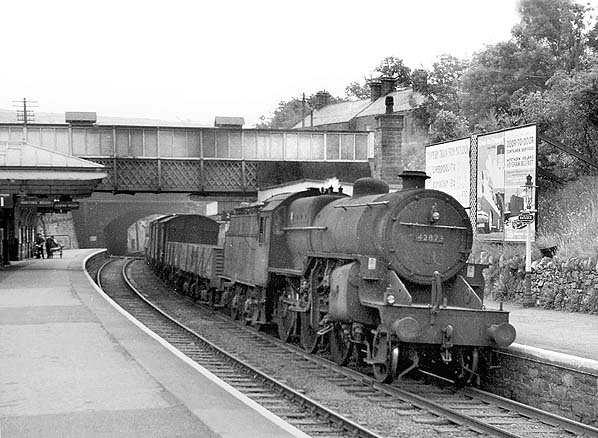 Those who joined these trains at Matlock were also asked to pay on the train, but continued to buy tickets at the Booking Office when travelling on the non-stop services as these also provided First Class facilities. tickets were still available from what was now referred to as the General Office at Matlock when it was open. This office now dealt only with parcels traffic, which itself was withdrawn within a few years. Track lifting on the closed section of line commenced in January 1969, the intention being to work from Peak Forest Junction towards Matlock. Suddenly, on 22nd August the work came to a stand. Work on lifting the track between Darley Dale and Millers Dale restarted on Monday 1st June 1970, with recovered material being removed via Matlock. A notice was issued advising that on Sunday 17th February 1971, the line from bridge 35 at Matlock towards Darley Dale was to be brought back into use as a Research Department test track. Even this short section of track was not retained for long and towards the end of 1973 it was noted as being dismantled. In 1975 a group was formed called Peak Rail. Their express intent was to reopen the line from Matlock to Buxton. They first had a base at Buxton but their efforts to run trains along the route of the line towards Matlock, part of which is still an operational railway at Buxton, were frustrated by British Rail. In 1987 Peak Rail acquired the Darley Dale station which is the next station to the north of Matlock. Peak Rail commenced running trains from Darley Dale to a point approximately 1 mile towards Matlock in December 1991. They had hoped to run trains into Matlock Station. Once again British Rail was unhelpful and stopped them. In the summer of 1992 they opened their own terminus a few hundred metres to the north of Matlock Station and called it Matlock Riverside. Trains conctined to use the former southbound platform. Excursions onto Peak Rail from the national network also started to run after July 2011. Sources: Rowsley : A Rural Railway Centre by Glynn Waite and Laurence Knighton, (Midland Railway Society), 2003 ISBN 0-9537486-2-6 and Cromford Station : A History by Glynn Waite, (Arkwright Society), 2009 ISBN 9780956270603. Both are available from the Rowsley Association. Additional notes and photo captions by Glynn Waite/Rowsley Association. Click here for a more detailed history of the complete closure process of the Derby - Buxton/Manchester line. Additional source Glynn Waite. Tickets from Michael Stewart, timetable from Rowsley Association, route map drawn by Alan Young. Click here for a list of Matlock Station Masters. became the terminus of a single track branch line to Ambergate. 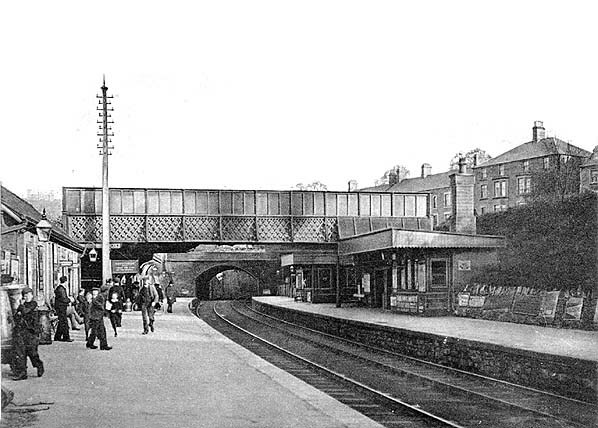 Matlock station looking towards the northwest in British Railways days. The photographer is standing on the northbound platform. 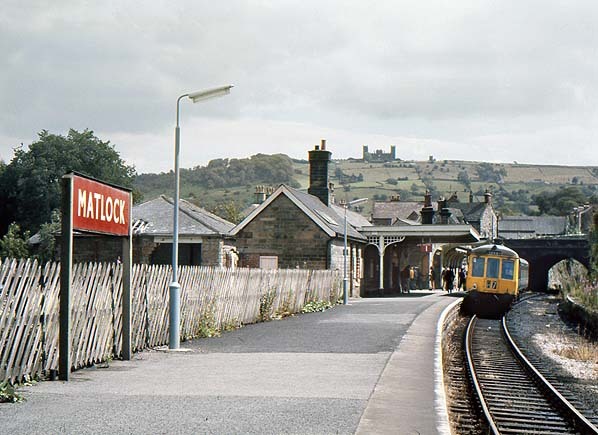 After closure of the Midland line as a through route Matlock became a terminus from 1st July 1968, but the line was not singled and the northbound platform taken out of use until 11th May 1969. Only the platform on the right of the picture was kept in use. By the end of 2010 the northbound platform should once again have rails to serve it as it is intended that it will be the terminus for Peak Rail heritage line services. The extensive goods yard is seen beyond the up platform. 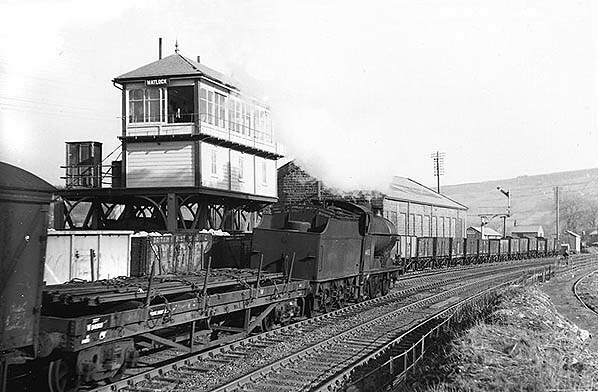 A goods train travels south past Matlock's signalbox and goods shed in March 1952. 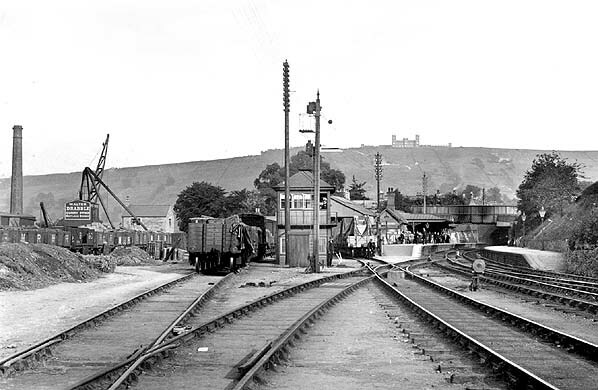 The train would have quickly reached Matlock Station which is just visible in the distance on the right. Matlock station looking southeast in July 1974, note the track has been lifted in the down platform. Looking south at Matlock Station in October 2009. The lines in the foreground form the new connection to the Peak Rail line which at the time that the photograph was taken had not come into use. Peak Rail will use the currently derelict northbound platform, to the right of the picture. Terminating services from Derby will continue to use the former southbound platform. On 9 October 2011 an ex Ministry of Supply J-94 0-6-0ST class locomotive number 68013 stands at Matlock station having worked a Peak Rail service from Rowsley South. Peak Rail started to use platform 2 on 2 July 2011.